The Olszewskis had a fairly typical wish list for their house search: good schools, single-story, plenty of light, a big lot for their kids and dogs to play. They just didn’t expect Nicole to find and buy it while Brett was out of town. A sales and marketing services V.P. at the same firm where Nicole previously worked in operations, Brett, 41, typically travels three days a week. 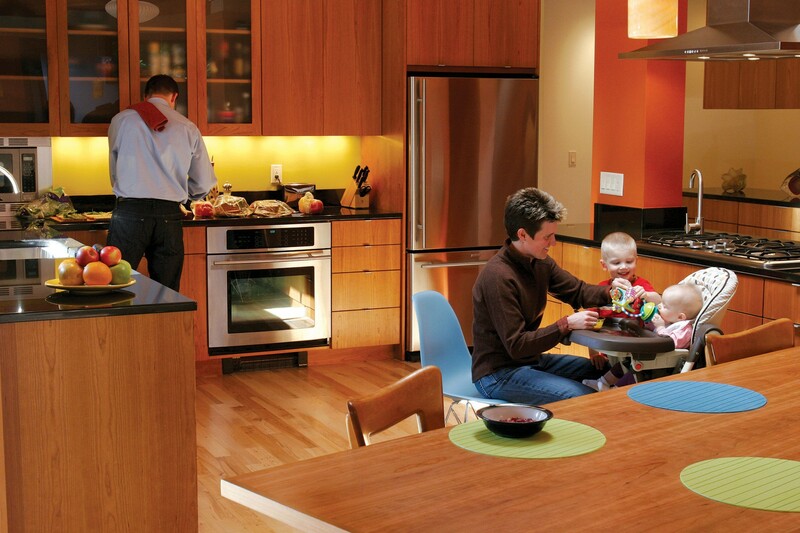 Now their lifestyle, their home and the eight-month renovation they did on it is all about the kids. 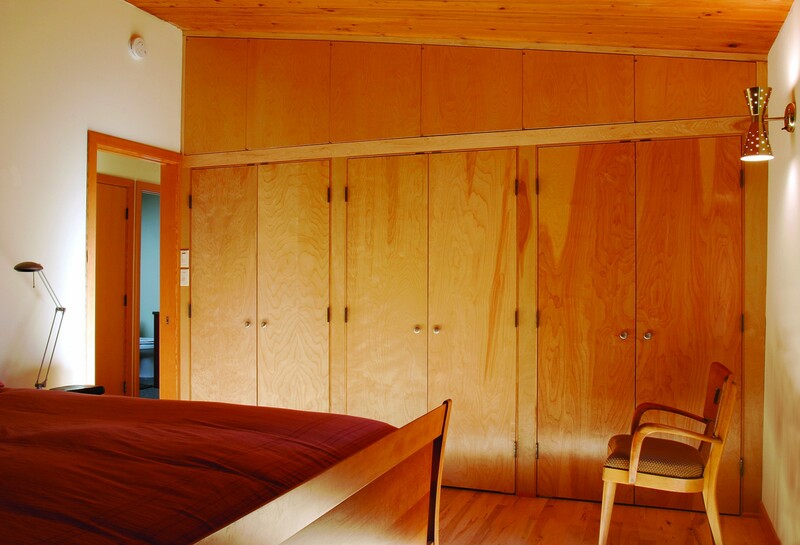 While some would have embraced the vintage paneling on the living room walls, the Olszewskis opted for drywall instead, thinking that the natural wood ceilings and new maple floors were enough of a good thing. 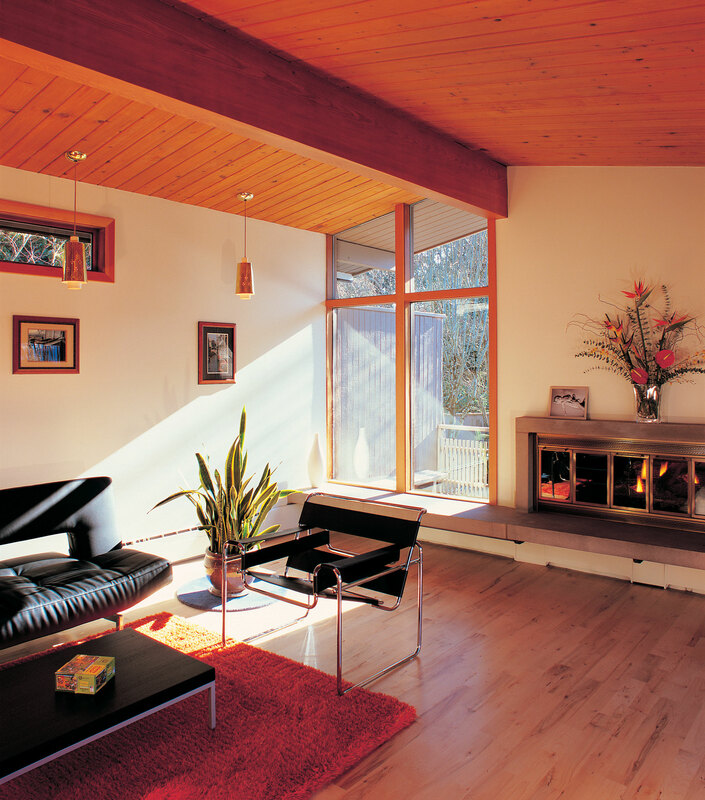 The minimalist fireplace surround and floating hearth are original to the house, as are the pierced pendants hanging near the craigslist Wassily style chair and the Innovation Wings sleeper sofa. An IKEA coffee table and area rug round out the furnishings. 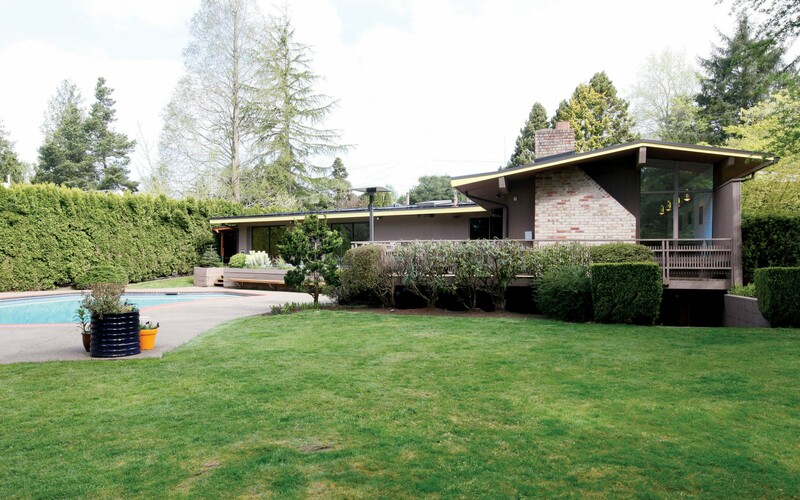 Designed by Northwest architect Robert “Bud” Oringdulph in 1958 for his lumberman brother, the custom home had huge potential in the couple’s eyes. By the time Nicole and Brett bought it in 2007, the series of doors, hallways and curtain walls—not to mention a narrow dining room addition from 1980—seemed dated to the couple. Their fifth house in 15 years, this was the one that they were ready to sink some time and money into. They knew they needed professional help and had intentionally sought out a Realtor with a history of house flipping, thinking her resources might prove valuable. Those contacts led to both Bock and contractor Randy Chandler, who served as a consultant to Nicole and recommended many of the subs. The Olszewskis had toured Frank Lloyd Wright’s Taliesin West and admired the “great room” and built-in furniture, particularly the tables built into columns and the couch nooks near his fireplaces. They and Steve Bock worked to flavor their remodel with Wrightian touches—the desk and dining table as well as media storage in the entertainment room. Previously, a blank wall greeted visitors as they stepped into the entry vestibule. Now, the house welcomes you into its heart. In addition to Bock’s design skills and past experience, the Olszewskis valued his private life as well. “We looked at his work and he seemed very capable, plus his status as a part-time architect and stay-at-home dad all seemed to be a good fit,” Nicole says. “Because he has two kids, he knew about patterns in a house, routines as they grow older, so that was important,” Brett adds. Much of the house was gutted back to the studs, and posts and beams were moved, replaced and trimmed out. The stairway to the basement was opened up and the awkward front entry hall was reworked so there is now a line of sight clear through the house the moment you step in. 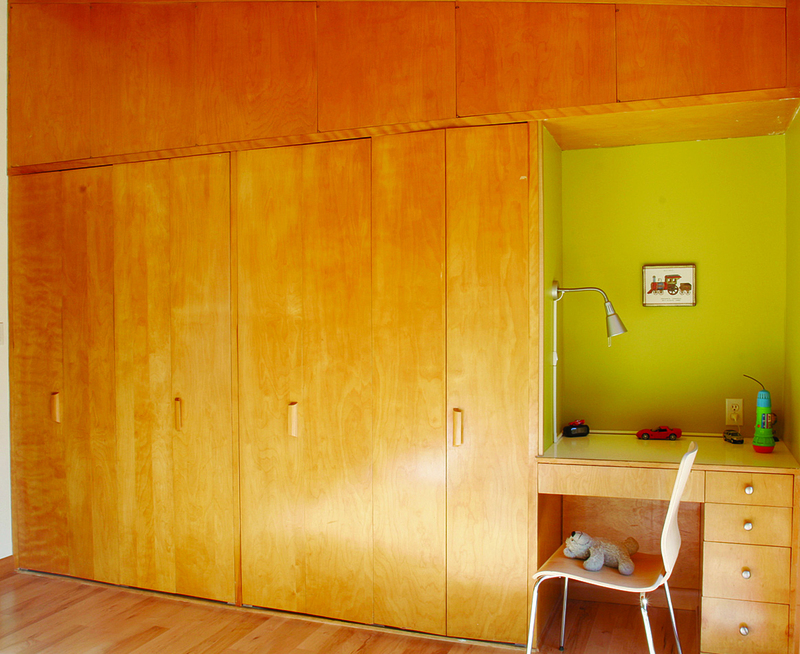 Since Bock and Brett are fans of Frank Lloyd Wright, they favored as many built-ins as possible, but budgetary constraints meant paint accent colors replaced custom wall paneling planned for the living and family rooms. When you step through the front door, the view ahead is of the new kitchen and main living space. Although Robert Oringdulph’s as-drawn plans called for a curved pony wall partitioning off the kitchen, it had been closed off from the rest of the space with full-height walls and multiple doorways. The newly opened up area houses the kitchen proper, a long built-in dining table, an expansive desk for future homework, as well as additional storage in a custom buffet in the lightened and brightened hallway. Brett and Nicole with Nathan and Grace. 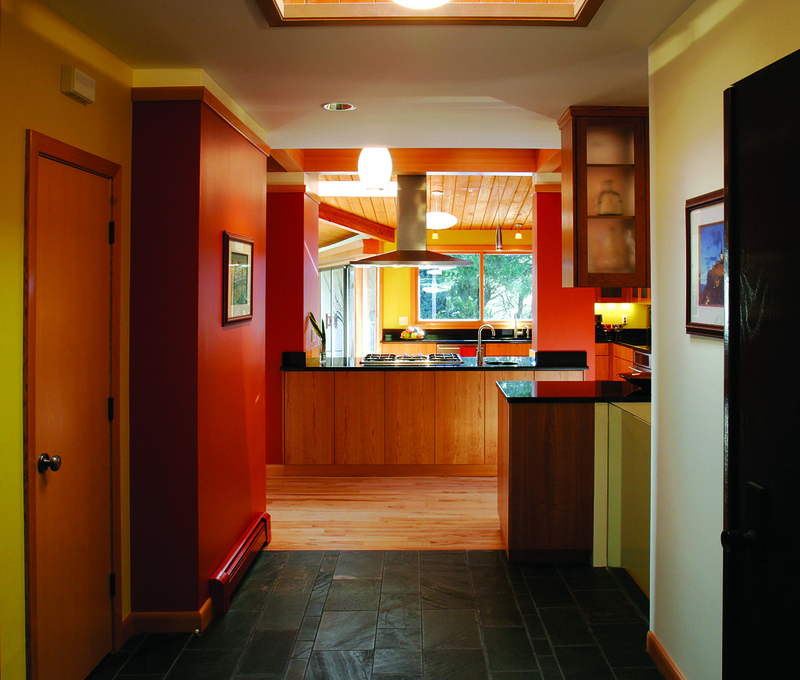 Spatial changes, the overall palette and paint colors were driven by Bock, while Nicole put his suggestions through the Olszewski filter and chose plumbing fixtures, lighting, appliances, cabinetry, counters and flooring. The couple says working with Luxe, a local lighting store, and Surface, a tile/flooring shop, was invaluable. “The kitchen wouldn’t have had nearly enough light if we went with what was spec’d in the blueprints,” Nicole asserts. The lot opens up to an expansive back yard, which came with a pool the homeowners hadn’t bargained for. Removing it or adding safety amenities would have both added significantly to the budget, so they chose to keep it and now find it’s integral to their family. Under the gable end, you can glimpse a door to the daylight basement, as well as the original light fixtures in the living room. As is often the case, the home’s potential was tantalizing, and between unexpected dings like the suddenly leaky roof ($30,000-plus for a commercial grade solution) and pool upgrades (childproof fence, safety cover and solar heater), the schedule ran over two weeks. Not bad, considering. They had three budget benchmarks to hit: target: $120,000; padded for overruns: $150,000; worst-case scenario: $175,000. Of course it cost even more than that in the end. Not long ago, Nicole ran into the daughter of the original owner, who’d grown up there. As it turned out, their married-with-kids status helped net them the home during the mini bidding war, as she wanted a young family to experience the house as her family had. 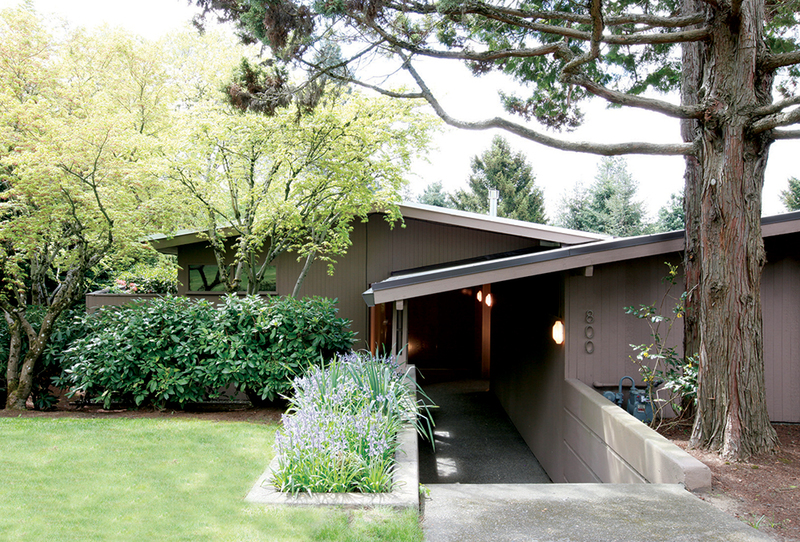 Sited below street grade, the front facade is unassuming, a typical criticism of the ranch vernacular.